2005 Amada HFE80-25S 80 Ton x 100” CNC Press Brake s/n HFE80-25S-V050251 w/ Amada CNC Controls, 800kn Force, 200mm Stroke, 101 ½” Base, 16 ½”Throat, Quick Lock Tooling Holders, Lasersafe Safety System. 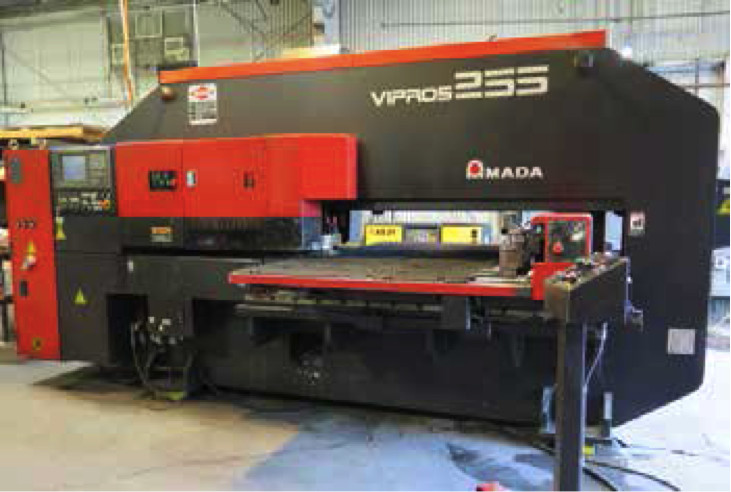 1998 Amada VIPROS 255 20Ton 31-Station CNC Turret Punch Press s/n AVP55119 w/ Fanuc Series 18-P Controls, 31-Statin Turret, (3) Indexable Tool Stations, Auto Repositioner, Brush-Top Table, SBC EX30 Cooling Unit. 2013 Amada TOGU III Punch Die Grinder s/n 30231233 w/ Amada Controls, 6 ½” 3-Jaw Chuck, Diamond Grinding Wheel, Coolant, Full Enclosure. Edwards 65 Ton Ironworker s/n 4126507 w/ 5” x 5” x ¼” to 4” x 4” x 3/8” Angle Shear, 3/8” x 24” to ½” x 14” Flat Shear, 1 1/16” thru ¾” Punch Cap, ½” x 6” x 3/8” Notching, 10” Brake Die, Foot Control. 2000 Ercolina Type CE40H-3 Power Roll Bender s/n 2060296 w/ RC-100 Controls, 6 ¾” Rolls. 2008 Ercolina Type TOP030TRIF Tube, Pipe and Profile Bender s/n 300826 w/ TB-100 Controls, Bending Dies To 2 ½”. 2009 Pem-Serter Series 4 mdl. L4 6Ton x 18” Hardware Insertion Press s/n L4-4828 w/ Tooling. Jet mdl. JMD-18PFN Milling/Drilling Machine s/n 9013747 w/ 9 ½” x 32 ½” Table. Wilton mdl. 7040M 10” Horizontal Band Saw s/n 0708121 w/ Manual Clamping, Coolant. 2005 Rutland 20” Vertical Band Saw s/n 550360 w/ Blade Welder, 27” x 29” Miter Table. 2008 Top-Tech mdl. MJ7115 5” x 10” Bench Model Surface Grinder s/n 0803237 w/ 5” x 10” Magnetic Chuck. Packard 16-Speed Bench Model Drill Press. Darex mdl. V390 Precision Drill Sharpener. Jet mdl. JOVS-10 Oscillating Spindle Sander s/n 07035710. Ryobi 10” Tilting Arbor Table Saw. Nordson “Encore LT” Powder Painting System w/ Gun and Fixed Sprayers. Electric Drills, Sanders, Grinders and Tappers. Komatsu mdl. EG25T-11 4000 LB Cap LPG Forklift s/n 469098A w/ 3-Stage Mast, 188” Lift Height, Solid Yard Tires. Toyota mdl. 42-5FGC25 4000 Lb Cap LPG Forklift s/n 43134 w/ 3-Stage Mast, 185” Lift Height, Side-Shift, Solid Yard Tires. Cantilever Sheet Stock Racks w/ Aluminum Sheet Stock. Cantilever Bar Stock Rack w/ Aluminum Square and Round Tube Stock to 9” Dia., Steel Round and Square Tubing to 5” Dia. P.Pryibil Machine Co. 22” x 44” Spinning Lathe w/ 5-Speeds, Tooling Support Arm and Spin Tooling. P.Pryibil Machine Co. 18” Spinning Lathe w/ 5-Speeds. Miller Millermatic 350SP Arc Welding Power Source and Wire Feeder s/n LG093528B. Miller Millermatic 350P Arc Welding Power Source s/n LH450110B. Miller Syncrowave 250DX CC-AC/DC Squarewave Welding Power Source s/n LC290017. Miller Syncrowave 250 CC-AC/DC Arc Welding Power Source s/n LA253349. Miller Millermatic 251 Arc Welding Power Source and Wire Feeder s/n LH040658B. 2014 Kaeser AS25 Sigma 25Hp Rotary Air Compressor s/n 1014 w/ 120CFM @ 125PSIG, 656 Metered Hours. Wire Carts w/ Electrical Wire. GE 30kVA Transformer 480 Primary : 240-120 Secondary. Schmidt Sand Blasting Pot w/ Gun and Hoses.